What is the story behind the devotion to the Sacred Heart of Jesus? The Catechism of the Catholic Church, quoting Pope Pius XII's beautiful encyclical Haurietis Aquas (1956), states, "[Jesus] has loved us all with a human heart. 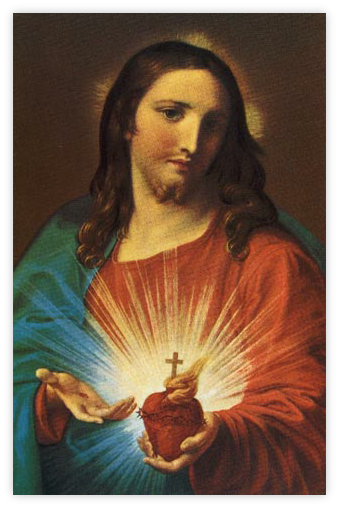 For this reason, the Sacred Heart of Jesus, pierced by our sins and for our salvation, 'is quite rightly considered the chief sign and symbol of that... love with which the divine Redeemer continually loves the eternal Father and all human beings' without exception (No.478). Devotion to the Sacred Heart (also known as Most Sacred Heart of Jesus) is one of the most widely practised and well-known devotions. It takes Jesus' physical heart as the representation of his divine love for humanity. The devotion especially emphasises the unmitigated love, compassion, and long-suffering of the heart of Christ towards humanity. The origin of this devotion in its modern form is derived from a French Roman Catholic nun, Marguerite Marie Alacoque, who said she learned the devotion from Jesus during a mystical experience. The Sacred Heart is often depicted in Christian art as a flaming heart shining with divine light, pierced by the lance-wound, encircled by the crown of thorns, surmounted by a cross and bleeding. Sometimes the image is shown shining within the bosom of Christ with his wounded hands pointing at the heart. The wounds and crown of thorns allude to the manner of Jesus' death, while the fire represents the transformative power of divine love.